Honestly, I can't remember for how long I wanted to take part in Carol's (author of the blog May Dreams Gardens) Garden Bloggers' Bloom Day meme, which takes place on the 15th of each month. Never got it done so far, but the stars seem to have lined up properly, so today is the day! 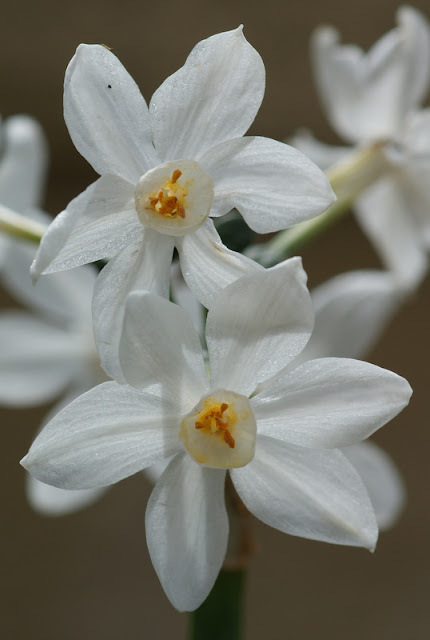 I am completely enchanted with Narcissus papyraceus or more commonly known as Paperwhites. Aren't the little flowers incredible charming? I have forced Paperwhites indoors before, but never put the bulbs in the ground until this year. They are supposed to be planted in autumn, but I didn't get around to do it and only planted them in February, fully prepared to see never ever anything of them, again. But to my big delight four have come up so far and gifted me with these lovely wonderfully fragrant bloom. My Martha Washington geraniums just started to bloom. This is the variety 'Regal Elegance Rose Bicolor'. They really brighten up my front yard. A post about my garden wouldn't be a post about my garden without roses. I simply love roses! 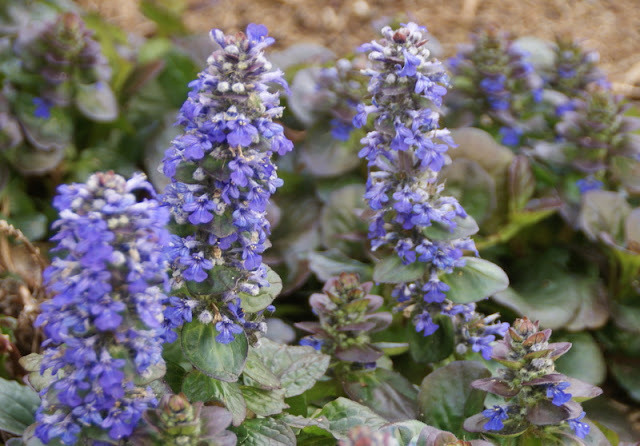 Many varieties are just opening their first blooms. Here you see 'Climbing Iceberg'. 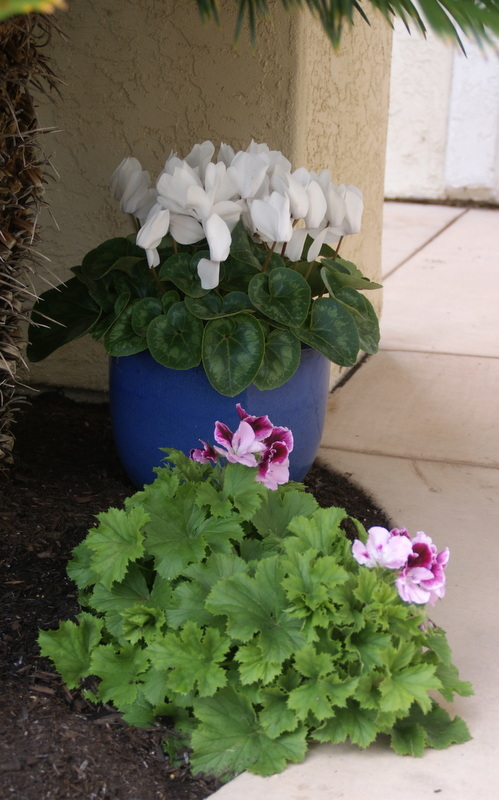 My trusty white cyclamen is in full bloom. Each year it flowers that prolifically. In the foreground you see another Martha Washington geranium. I think it is a seedling that mother nature planted there, it wasn't me for sure. Here is a close-up of the blooms of the Martha Washington geranium plant shown in the photo above. I think the color of the flowers is very pretty! 'Old Fashioned Girl', a miniature rose. I really love the blue flowers of Ajuga reptans 'Catlin's Giant'. Despite its beauty, so far it has proven to be a pretty tough, no-fuss plant for me in my garden. These flowers of rosa 'Marie Pavie' are hidden deep in the bush, but there are many more on top of the plant that just seem to wait for a warm day to spring open. My favorite alstroemeria Princess Lilies 'Claire'. The snails have damaged many blooms, but here I caught one cluster that is not touched by them, yet! 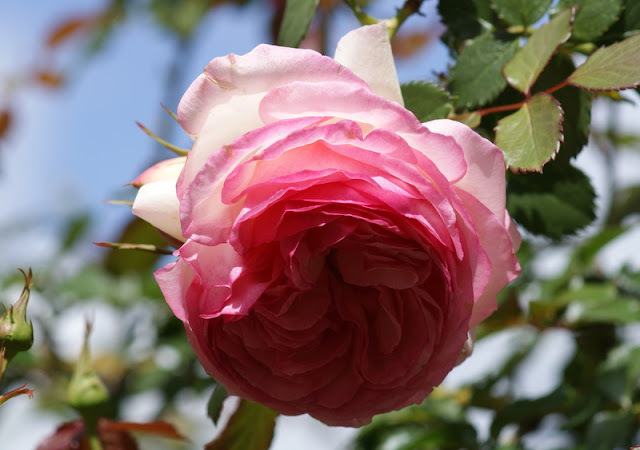 Rosa 'Pierre de Ronsard' has produced some blooms of a giant size. The relatively cool March days enabled the rose to do that. Another bloom of 'Pierre de Ronsard'. They are just gorgeous! 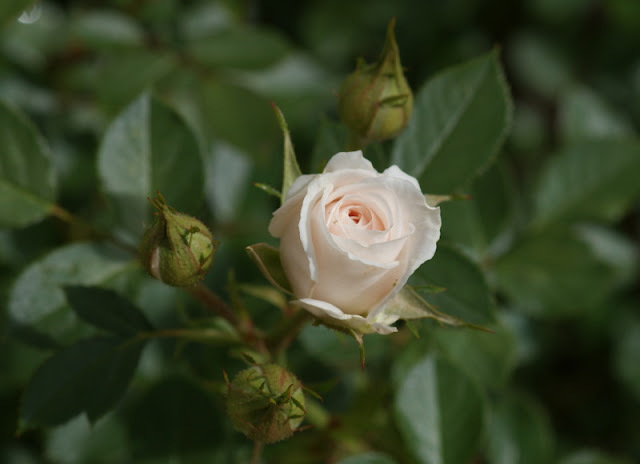 My favorite rose at the moment: 'Madame Alfred Carriere'. Because of the cooler days she has taken on a very muted apricot hue, usually she is plain white here in summer. Just love the color and old fashioned bloom form of this Tea Noisette. 'Georgetown Tea' flower bud unfurling. Iris 'Platinum' kissed by the spring sun! I had trouble growing irises for the longest time in my garden, but now it looks like that I have finally gotten the hang of it. Acidifying the soil slightly around the irises with soil sulfur and fertilizing them with organic rose fertilizer seem to have done the trick. I am curious to see what flowers others have blooming in their gardens at this time of the year. 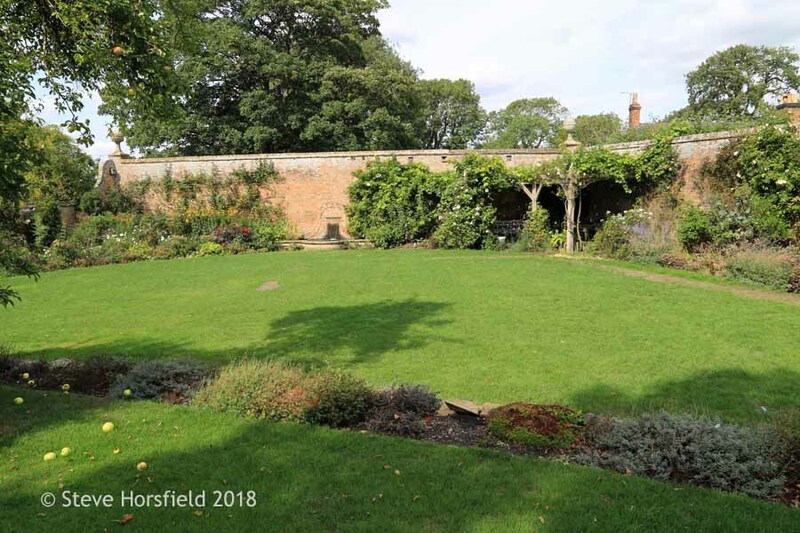 So I will pop over tomorrow to Carol's Garden Bloggers' Bloom Day meme and have a look at her and other bloggers gardens. Why don't you join me? Just click on the link! 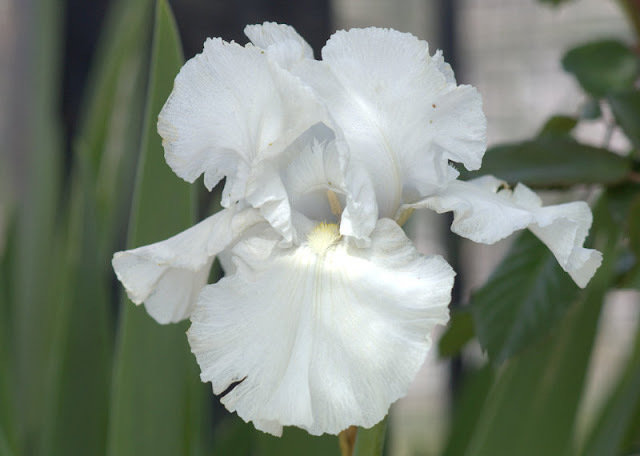 Your Iris 'Platinum' is a joy for the eye. When I see your flowering Martha Washinton Geranium I think of the cuttings I took last autumn of this Geranium, they have rooted by now, so within some weeks I will put them in pots. 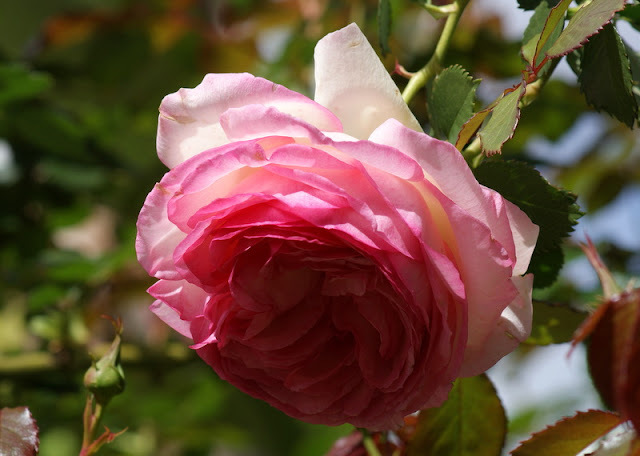 I'm looking forward to summer because I envy your 'Pierre de Ronsard' flowers. Last Saturday I've been pruning this rose. Just finished pruning all my roses it took me two and a half days, now I still have to tidy up the prunings and fertilizing. I think I put Madame Alfred Carrière on my wishlist, but.....where to plant.....I know this one takes lots of space. 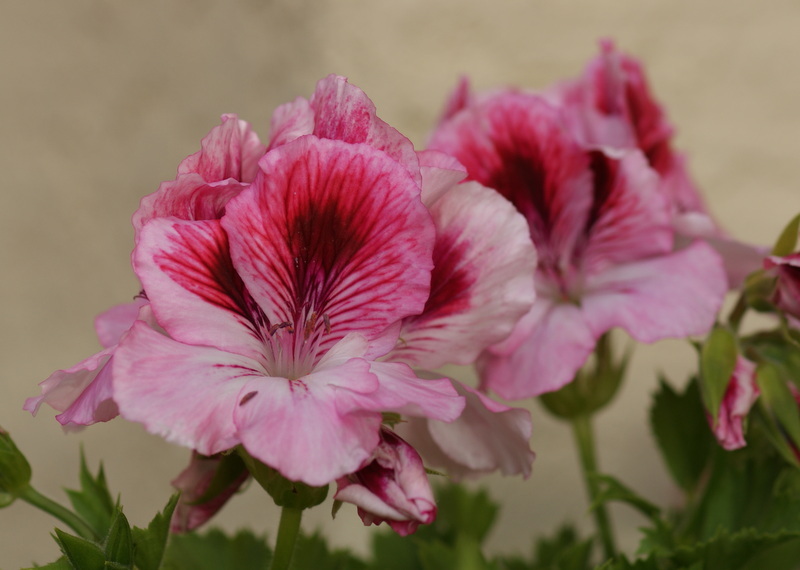 Janneke, congratulations on rooting Martha Washington Geraniums! 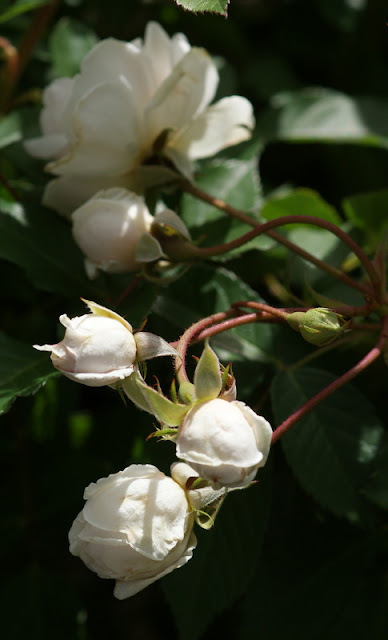 Pruning all your roses in just two and a half days? You must have been working really, really hard. 'Madame Alfred Carriere' is an awesome rose, but its huge. I wonder when mine reaches maturity. It is planted between Queen Palms and a Pine Tree, so the root competition will keep it in check size-wise, or at least that is what I thought ;-)! Están todas preciosas pero las rosas son maravillosas. Besos. 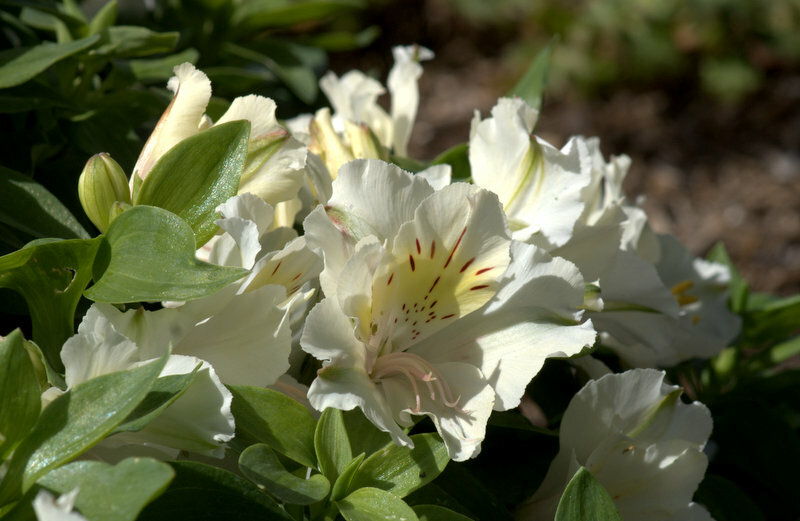 I remain very impressed by that white Alstroemeria, which I intend to snap up if I ever come across it in one of my local garden centers. Your roses are gorgeous but that goes without saying because they always are. Happy GBBD! So many lovely white and pink flowers ! Your garden is starting to look gorgeous, Christina ! Well done ! 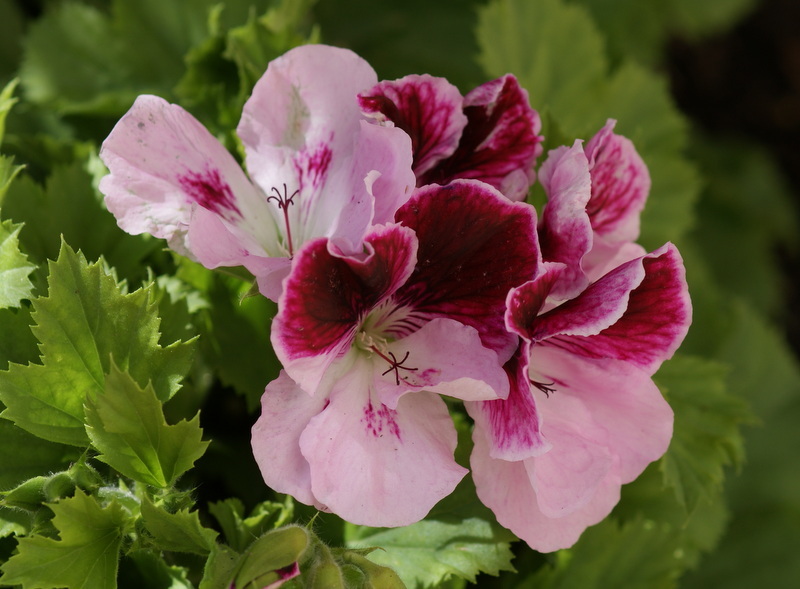 Beautiful photos, I love your geranium, they don't over winter in my garden, but I hope to get organised enough to have some in pots that I keep in the greenhouse in the colder months. Your roses are, as ever, immaculate and beautiful. Janet, since I visited Parham Gardens in England, I have become a big fan of the Martha Washington Geraniums. Here it is not a problem to overwinter them outside, it is more of a struggle to get them through the heat of summer. I would love to acquire some that are flowering in more muted colors than the ones that I already have, but they need to be ordered at special nurseries. 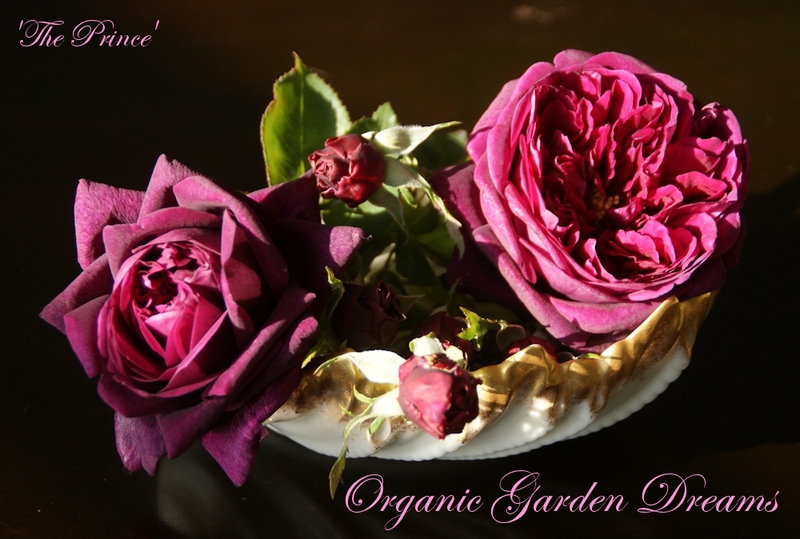 Thanks for your nice compliment regarding my roses! 'Madame Alfred Carriere' is a lovely rose. I like your idea of restricting the root growth, food for thought! Your roses are beautiful Christina and wow! you have a bearded Iris already, it must be very warm where you are. The Pelargoniums are pretty too; do they flower all summer? Christina, thanks for your kind words about my roses! Yes, it is very warm here and on top of that we had an exceptionally warm February. The iris seems to be completely confused by the weather. It was blooming already in the winter! The Martha Washington Geraniums have a very long blooming time here, but as far as I remember from last year, they were shutting down in the high heat of summer. Wow, there still is a "bloom day"...cool. I saw a vase day also lately. Enjoying your geraniums and ajugas. The pink flowers are from a Okame Cherry. 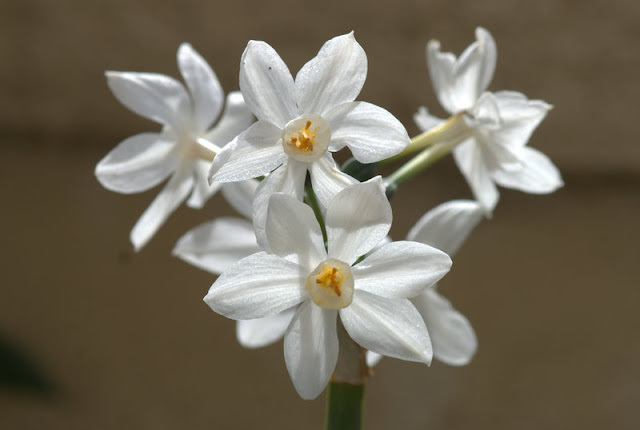 Le narcisse blanc est d'une beauté remarquable et la forme des fleurs est une curiosité que je découvre avec plaisir. Les autres fleurs du post possèdent la même élégance et les roses en boutons ou écloses promettent de belles floraisons à venir. Le rosier Marie Pavié m'a séduit depuis quelques années et je suis heureuse de lire que vous appréciez son charme et sa facilité à fleurir pendant de longs mois. Wow what a lovely post Christina. 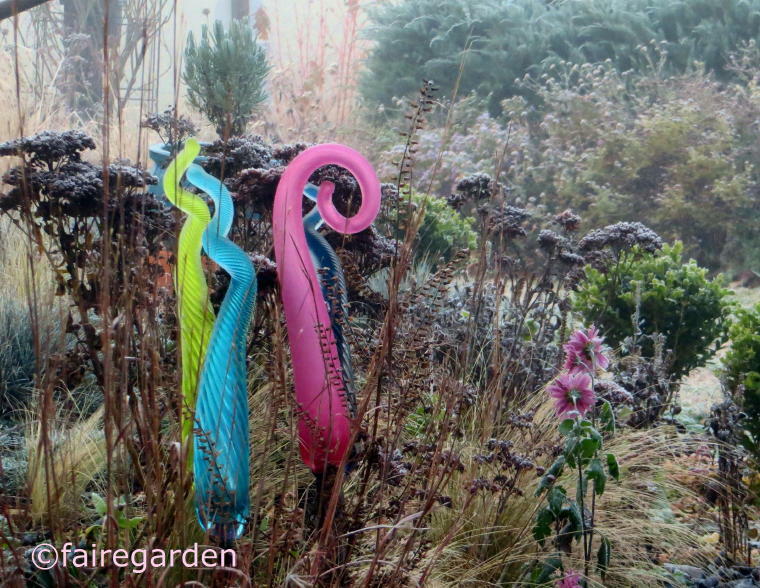 Wish you a beautiful garden year!! 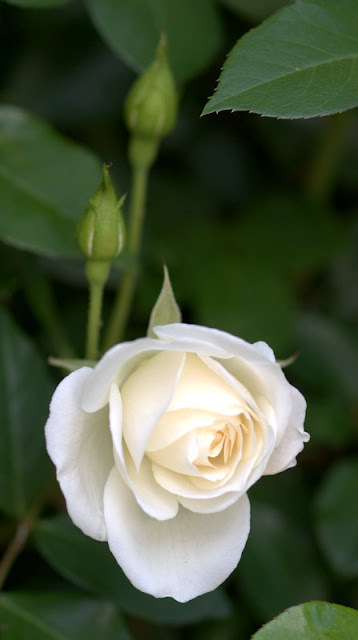 Hi Christina, I am always impressed by the variety of beautiful roses that bloom in your garden. And your Martha Washington geranium is outstanding! Happy gardening! These flowers are beyond beautiful. I am amazed at your talent and green thumbs as they say! I hope I can succeed at roses here in Missouri. I may be turning to you for advice! Thanks for sharing and linking. The Most Exciting Garden Time of the Year!